One more Magazine style Blogger Template "SchemerMag"
After very good response on my previous Magazine style Blogger template Turn out Mag, I decided to go for one more Magazine style layout.. so, here it is..
As usual, this is a wordpress to blogger conversion.. wp theme by Chiq Montes of wpthemedesigner.com and converted to Blogger by me. Step 0: First , follow the basic installation steps here. 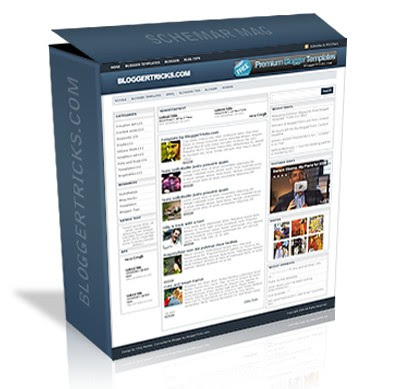 and Replace the Anchor text (Blogger Templates,Blogger,Blogtips) and their respective links to your needs. and again, there's another navigation bar..
and edit the anchor texts,links as you wish. Just go to Layout and edit the gadget as shown below and paste your adsense code (468 x 60px) and save it.. The .psd file is included in the template download file. Just open it with photoshop and edit the text and save it as image file (.jpg or .gif). Next , upload to any image hosting servies and copy the image url of the uploaded image. Next, go to Edit html and replace this image url in the template with the one you just copied now. I very like this temp,but I have a question, I want to change "READ MORE" to other language, how can I do that? You are so fantastic! I'm very thankful to you. I like it very very much. Thank you! I got a problem, everytime I SAVE the layout, blogger gave a error massage. How to set margin inside blog post? everytime blogger give a error message.When do I save the layout..how can I do that? kool template bro... really liked it... right now I'm using your Turn Out Mag template... will use this in near future... props for the your work buddy! PS: I'm really curious about the 'Thumbnails on articles (automatic resize)' feature... what exactly is that??? yes, I also happens when I try to save the changes, blogger gives me an error message. I can do to fix this? It look great, but lack of function. Can the image be auto-resized in the mini post to that small, but showing the original, big version in the single post? This has been done here: movieloo.info. I am glad if this is possible. One more thing, the comment form should be styled, too. Thanks for the great template and hope to see the improvement. Well, we can change the background i think.. I added automatic thumbnails and automatic post summarize to the templates.. check it out! I tested the logo .psd once again and found no problems here.. Anyhow..u fixed the problem..nice.. But, .png has a few problems with IE...check out in internet explorer. Thanks for the suggestion. I looked at Bloggerbuster but, I didn't found that feature. I tested again.. No problems here.. Just clear all the cookies and restart your PC and try again. What's the error message it is showing..? I got the error 'bX-cyccq' when I was trying to drag and drop my blog elements on the Layout tab. I did not seen labels, author name, post date in the post page. can you tell me how can i add. im waiting for your reply. and please tell me my last question query. I am having a problem finding the image url in the code so that I can replace it with my own. Been through it 5 times and can't find it. Did that part change? How do I change the logo since that url is not in the template? im waiting for your reply, please tell me the answer of my previous query. eeek! I find this wonderful template exactly what I want after spending a week trying to get another magazine style template to work. Since I am new to using custom template, what do I do if I choose to use parts of your template like the auto summary feature in another template. Do I need to add to footer something like Original template by X, incorporating features by Y etc? it is like the error bX-cyccq is a mass error for this layout isn't it? anyway... thanks for your times to converted it. Hi there thanks for this temp. I've chosen this for my blog but when I change my page element that time I get a error that is bX-cyccq please help me about that. It is really a superb template. Thkx. I'am also getting the bX-cyccq error when saving. TO all the guys having bx problems.. I'm working on the issue and soon will fix it..
Template did not show - labels, author name, post date in the post pages. please help to fix this problem. I am using your Turn Out Mag template and love it, but now that I've seen this one, I might change to this, because it looks great! The image url you reference in the instructions (http://i43.tinypic.com/er0iyo.jpg) is not in the code. Is there another url I should be looking for? very nice template n every thing is in build but i got problem that"i cant set recent post entry in recent post element". plz tell me how to set that my blog is "http://think-4-2morrow.blogspot.com"
I got the error when i am trying to save'bX-cyccq' and when I was trying to drag and drop my blog elements on the Layout tab. Thanks very much, it is very good template but I don’t get post date and other icons on post footer, specially I am not able to add ‘Share this’ icon to my post, would you let me know how to do that. Hi, thanks for the template. How does the Read More function work? it dosent' seem to be working on my blog. 1-As you mentioned there is a bx problem when editing the layout. 2-Feed gadget can't be added. 3-When used blockquote in posts, it can't be noticed as something different. very very cool template... i must have this one on my template collection..
How to edit the post to read more? HI..THANX FOR THE WONDERFUL TEMPLATE BUT I GOT A PROBLEM INSTALLING MY BLOG LOGO. I HAVE NO PHOTOSHOP PROGRAM, IS THERE ANY OTHER OPTION TO DO THAT?? This template looks really cool! I'd like to use it for my own but unfortunately I don't have Photoshop, either like many other on here. Will you please suggest a few alternatives? It'd be great if you could add a function so that we can simply type in the title logo from the Blogger layout page. Hoping you will do well on your exams! This template is awesome, but I am having the same problems as others when dragging the page elements, it gives me an error message. But somehow I arranged it by starting the elements anew. The problem for me is that I have set now that comments are allowed and yet it does not work. it says that the administrator has not allowed replies to this post, which is not the case since I have set the comments section ok at blogger. Edit: The comments are working now. surely blogger needed a time to set up this. I am having a problem finding the image url in the code so that I cant replace it with my own. Been through it so many times and still can't find it. Did that part change? How do I change the logo since that url is not in the template? Thanks for this very cool template Kranthi. I am now using the fresh copy and there is no more bx errors. However I would like to ask you something. Is there a way to put pictures centre and the text under of it? Whenever I post pictures they go to left of the page and text to right. Sometimes it doesn't look so good. Can you add labels, author name, post date in the post page? I will again ask your help about on this template. When google indexes my posts, it shows in search result page, the things that are in left sidebar first. For example "Categories. music (2); news (2); random stuff (2); software (21); sport (2); technology (26); tv series (3); website (32) ..." I looked at live demo but no problems there. What can be wrong? I will be very appreciated if you can help me. Could you add the bookmarking buttons like from bloganol.com. I pasted the codes but nothing showed up. I am not sure which template to use, i am already using one of your template, anyways keep it up man.. I got just one post showing at the first page. How can i show the homepage showing more than one article. Mine still shows just the thumbnails on articles. and the post count on the first page is just one. How do i change that. how i can add recent posts at right side?? my 2nd question my site is not fit to screen as compare to demo site my site showing big..
Maybe your computuer resolution is small. This is really great and all but when you go to the post page, the picture is still a thumbnail. How to fix? I really like this tamplate and i like to make my blog with it. But i have some broblem and i like to resolve. The resume of posts is locate at one box everyone and like your demo they have stay each in own box, how can i solve that? Template looks very cool :) But having problems with IE7. I checked with firefox, chrome, opera and safari and there are no problems. date is not showing up and is there a way to show ads after a posts title.the trick yiu mentioned here http://bloggertricks.com/2007/12/placing-adsense-ads-inside-or-between.html is also not working. how can i add recent comments & recent posts??? thanks for this updated template, i will use this for my blog.. I've edit the logo and upload and copy the new link, but the logo doesnt want to appear in my blog? why? I have a questions. 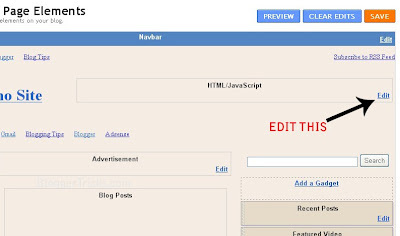 Why is there a MYBLOGLOG script in the template. Can I delete it? I dont know what it is and i dont have mybloglog. love the theme but do I need this script? Edit the logo text...help...The image url you reference in the instructions (http://i43.tinypic.com/er0iyo.jpg) is not in the code. Is there another url I should be looking for? yea.. u mean myblogtalk script? I hosted that automatic summarize and thumbnails script in my server.. If you want to delete it..download it first and then upload to your own hosting and replace the url. How can I place and Add This/ Share This button onto the body of the post? Also is there a way to add a date / time stamp to the posts on the home page and the post body page? Love this template but hate the colors. Is there anyway to change the colors? hey why doesnt the read more thing work? Thank you ! I use your template. nice clean template .. love it! for let more people enjoy your nice template .. i edited it to be ready for rtl languages .. this is the live demo is just a test blog . so can i share the rtl version in my blog with original credit and live demo ? and i ask if can i add a rtl editor link ( to my blog ) in rtl template version (in footer ) just for supporting blogger beginner users ? why don't the RSS feed image look ? i can't see the RSS feed image. Thank you.. You ar the best keep up! step by step info & just really good stuff. hi kranthi ,, how come that the header and sidebar of the demo is static, (like kinda an ajax mode) when a click whatever link. but when i install the template this feature doesn't work no more. just refresh as ever. do you have a trick for static header and sidebar like the demo? it will be cool to make that cause it cause speed charges and improves a lot all. Is there a way to just get the html code to get the same magazine style post layout for our existing themes? I tried to use this on my blog but am not that html savy to be able to customize it. I love the way the posts show up. Okay a couple of questions. 1. It does not allow me to put an Add This button to the bottom of my post. Can you help? 2. I don't have photoshop so can you please try to make my logo for me. All I want it to say is The Funny Blog. ^Same Please HELP!! It used to work before the update but now I can't put ads under the title or an AddThis button under the content. Right now trying to install your Mini Updates, got problem once I change url. thank you.. Take a look.. i make a some tweak of this template.. hehehehe..
buddy ur template is really cool, i like this. thnx for template, now testing it for my needs. quest1: how to change blogger rss to feedburner rss? quest2: archive widget is sited not stright (when i added it). how to improve? how are you , hope you are alright . I am so glad to had this template. but still i have some problems with the images in post. So somebody plz help to enable the comments. i hv enabled from comment settings in the blogger but no where to post the comments.